Model of the moment Cara Delevingne can be seen everywhere of late, from the catwalks of top designers worldwide to the cover of British Vogue magazine’s latest issue. The British-born model, renowned for her blend of energetic, fun-loving personality and quietly captivating beauty – not to mention those eyebrows, has been hailed model of the year by British Vogue and at just 20 years old, has already starred in an array of campaigns, most famously Burberry, Chanel and DKNY. Here at BPR we’re totally captivated by her sheer magnificence, so when these pics of the fresh-faced model popped up on our computer screens wearing the latest SS’13 make-up must haves, we insisted on creating you a ‘Get The Look’. Her flawless complexion, popping orange lips and touch of blue eyeliner makes up the perfect day-time look and we’ve got just the products to help you recreate it. 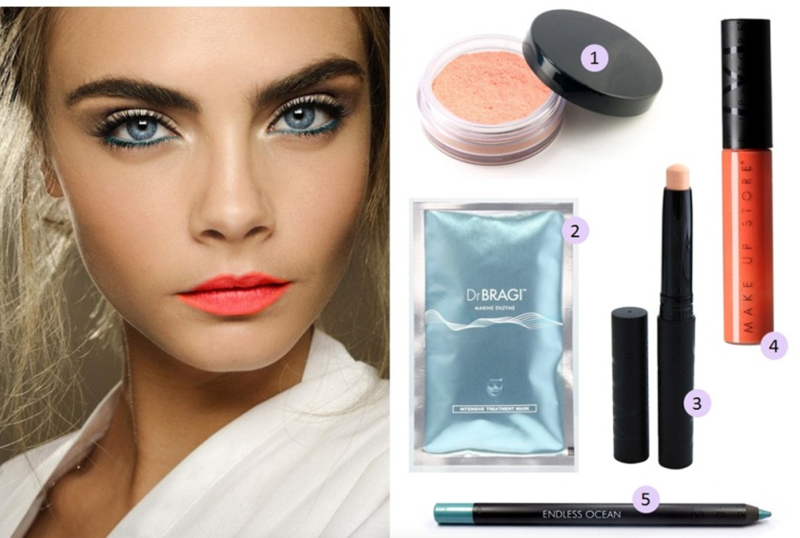 Start with a Dr Bragi Intensive Treatment Mask  the night before you wish to try out Cara’s look. This innovative mask is designed to rapidly target redness, dehydration, loss of firmness and signs of premature ageing, ensuring you wake up with a glow so bright it will hurt your eyes. Next, apply Make Up Store Care and Cover Concealer in Light  under the eyes to brighten the area and rid dark circles before applying your base foundation. Add Make Up Store Wonder Blush in Pharaoh  to the apple of your cheeks and a dash of Make Up Store Eye Pencil in Endless Ocean  to recreate her signature deep sea-blue eyes. Once finishing off the rest of your look with lashings of mascara, add Make Up Store’s Lip Gloss Wand in Tulip  to complete the look and seal the deal.